Thank you for your interest in making your one time payment or monthly payment to Metropark thru our Online Payment Center. We currently accept payments online using your Bank Account via ACH (most popular), Credit Cards, and PayPal. It's now easy to make your payments on time and at your leisure. The Metropark Payment Center Online is open 24 hours a day 7 days a week. This eliminates the need to make a phone call or stamp & mail anything. 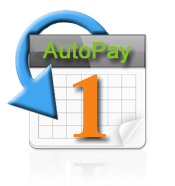 Avoid future payment hassels sign up for AutoPay today! !